Ashland Chamber Gift Certificates are good at over 40 businesses in the Southern Oregon ranging from specialty retail shops, restaurants, lodging properties, grocery stores, theatres, spas, local artisans, Ashland’s Oak Knoll Golf Course, wineries and more! They are the perfect gift for family, friends, coaches, teachers and/or someone you're unsure what to gift. They can come in any denomination $5 and higher. 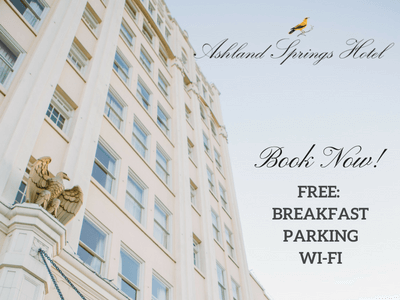 The Ashland Chamber Gift Certificate Program helps encourage local spending all year and makes it even easier for the local and visitor alike to explore Ashland. See list of participating businesses below. 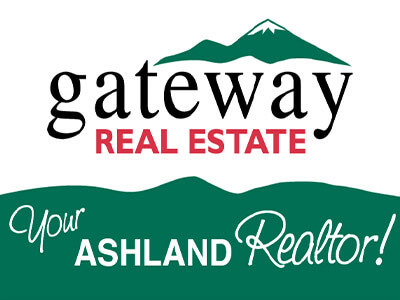 Ashland Chamber Certificates can be purchased at the Ashland Chamber office at 110 East Main Street (Monday - Friday, 9:00am to 5:00pm) or online by the clicking on the graphic to the right. These gift certificates can be mailed anywhere in the U.S.A.
Because each certificate must be spent at one merchant, we suggest that you purchase smaller denominations, (i.e. Two $25 certificates instead of One $50 certificate), so that the recipient can have more options of where to spend their gift. The Gift Certificates have an expiration date of 12/31/19. 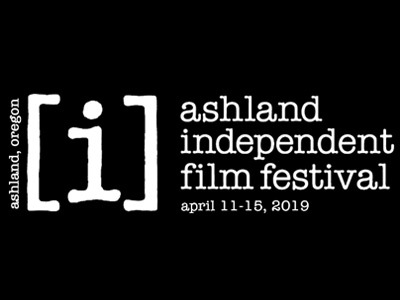 After that date, the gift certificate holder may exchange the certificate at the Ashland Chamber office for a new certificate. Each year the list of businesses who participate in the program adjusts. 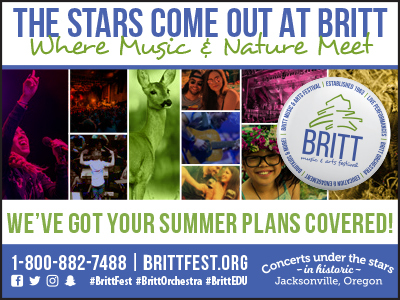 You may continue visiting this page throughout the year as businesses may join the program throughout the year. On Friday, December 21st, our office will be open from 9:00am to 3:00pm. The Chamber office will be closed December 22nd - January 1st. Our office will reopen on Wednesday, January 2nd at 9:00am. Any gift certificates purchased online after 1:00pm on December 21st will not be processed or mailed until Wednesday, January 2nd. Alchemy Restaurant & Bar - 35 S. Second St.
Ashland Food Co-op - 237 N. First St.
Ashland Hills Hotel & Suites - 2525 Ashland St.
Ashland Springs Hotel - 212 E. Main St. The Black Sheep Pub & Restaurant - 51 N. Main St.
Blue Giraffe Day Spa Salon - 51 Water St.
Branson's Chocolates - 1662 Siskiyou Blvd. Brickroom - 35 N. Main St.
Brothers’ Restaurant & Deli - 95 N. Main St. The Crown Jewel - 266 E. Main St.
Greenleaf Restaurant - 49 N. Main St.
Grizzly Peak Winery - 1600 E. Nevada St.
Hearsay Restaurant - 40 S. First St.
Larks Restaurant (Ashland) - 212 E. Main St. Liquid Assets - 96 N. Main St.
Luna Café & Mercantile - 2525 Ashland St.
Northwest Nature Shop - 154 Oak St.
NW Raw - 370 E. Main St.
Oberon's Restaurant & Bar - 45 N. Main St.
Omar’s Fresh Seafood & Steaks - 1380 Siskiyou Blvd. Ostras! Tapas & Bottleshop - 47 N. Main St.
Paddington Station - 125 E. Main St.
Paddington Station Inspired by Oregon - 131 E. Main St. The Paddington Jewel Box - 180 E. Main St. 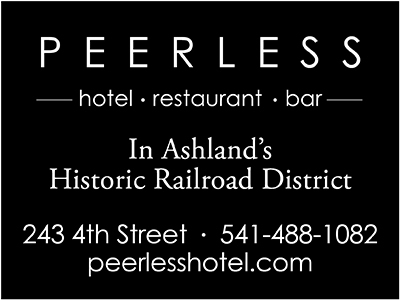 The Peerless Hotel - 243 Fourth St.
Peerless Restaurant & Bar - 265 Fourth St.
Pie + Vine - 358 E. Main St.
Plancha - 165 E. Main St.
Platt Anderson Cellars - 357 E. Main St.
Smithfields Pub & Pies - 23 S. Second St.
Smithfields Restaurant & Bar - 36 S. Second St. Standing Stone Brewing Co. - 101 Oak St.
Travel Essentials - 252 E. Main St.
Unicorn Gifts & Toys - 242 E. Main St. The Web•sters - 11 N. Main St. The Winchester Inn - 35 S. Second St.